Your shoulders are comprised of three major muscles known as the anterior (front) deltoid, the lateral (side) deltoid, and the posterior (back) deltoid. The best shoulder exercises are pushing movements that allow you to safely move heavy loads and progress to heavier ones. The best way to build your shoulders is to get as strong as possible on a handful of key exercises, including the barbell and dumbbell overhead press, the dumbbell side raise, and the Arnold press. The shoulders are the calves of the upper body. They’re small, stubborn muscles that, when underdeveloped, screw up the “aesthetics” of everything you’ve got going on above the waist. I can attest to this firsthand. This was taken after about seven years of consistent weightlifting, so as you can imagine, I wasn’t too thrilled. My chest and arms had some meat on them (and blubber), but my shoulders were woefully undersized in comparison. Soon after that picture was taken, however, I drastically changed how I ate and trained, and how I trained my shoulders in particular. Half-natty lighting, I know, but as you can clearly see, my shoulders were no longer a glaring weakness in my physique. It’s taken years of consistent training to get where I’m at today, but it would’ve taken a lot longer (or never happened at all) had I not made major changes to my old shoulder workouts. And fortunately, I’ve learned that building a great pair of shoulders isn’t complicated. You just have to consistently do a few things right and avoid a few pitfalls, and that’s exactly what you’re going to learn about in this article. By the end, you’ll know . . .
Let’s start with a brief overview of shoulder anatomy. 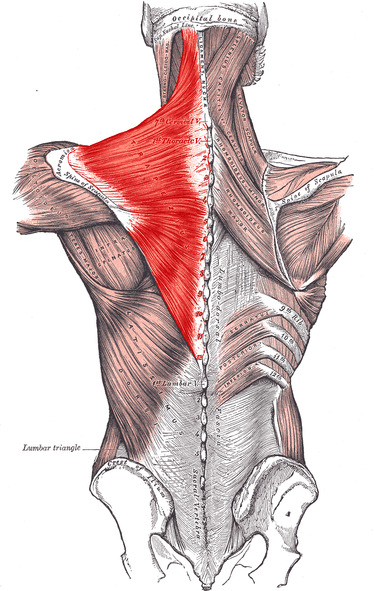 The shoulders are comprised of several muscles. There are smaller muscles as well that enable the ball-shaped head of the arm bone to spin and roll in the socket of the shoulder blade. When people talk about developing their shoulders, they’re talking about increasing the size of their deltoids. These are the big, visible muscles, and are what we’ll be focusing on in this article. 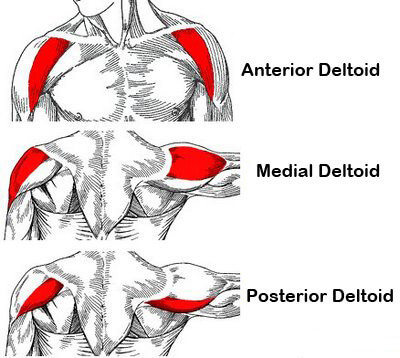 When it comes to training your shoulders, it’s very important that you work specifically to develop each of the three deltoids. Many people fail to do this by focusing exclusively on the anterior (front) deltoid through endless bench pressing and shoulder pressing. This can work for some people with great genetics, but for most, it results in underwhelming shoulders that lack the round, “capped” look produced by well-developed lateral (side) and posterior (rear) deltoids. (This was my problem in the first picture I shared above—lots of anterior and little lateral and posterior delt development). 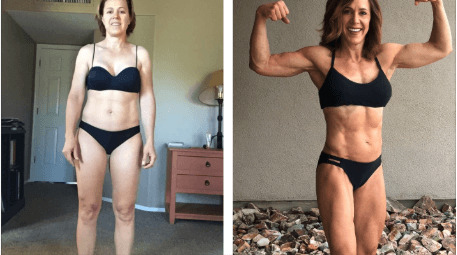 And while most women don’t have the same fixation on shoulder development as most guys, they generally do want above-average shoulder definition. That’s why I include a handful of sets of direct shoulder work in my programs for women, including Thinner Leaner Stronger. Most of the shoulder exercises I recommend also target the lats and biceps, which are on most everyone’s wish list. Most chest exercises, like the barbell and dumbbell bench press and incline bench press train the shoulders as well. Some people also consider the trapezius muscle, or “traps,” to be part of the shoulders, but that’s not entirely accurate. 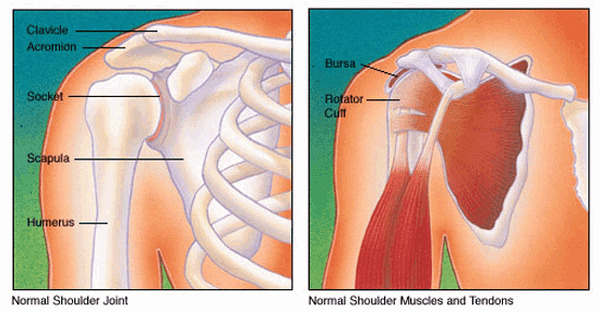 The traps stretch from the middle of the upper back to the top of your collarbone, stopping right where the lateral delts begin. Due to their proximity to the deltoids, the traps are involved in some shoulder exercises, but the muscle group doesn’t directly contribute to the size and look of your shoulders. Instead, the traps are the backdrop between your shoulders and neck and a major player in the development of your back, along with two other large back muscles, the rhomboids and the lats. 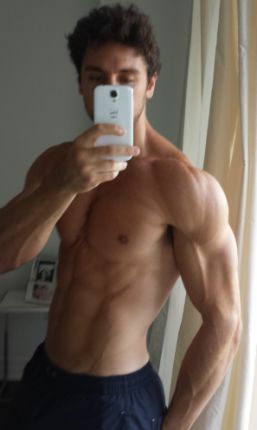 So, what’s the best way to build full, round, proportionate shoulders? Let’s review each in more detail and then learn how to train our shoulders correctly. 1. Doing the wrong shoulder exercises. I used to be just as guilty of this as anyone. I mostly did machine exercises and isolation movements, which aren’t useless, but can’t alone get you to your goal. Don’t worry, though. You’re going to learn all of the best shoulder exercises in just a moment. 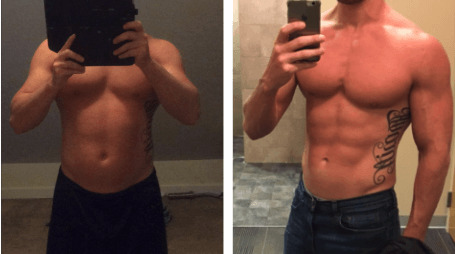 Want “one weird trick” for gaining muscle and strength quickly? Prioritize progressive overload in your training over all else. Yes, over your exercise selection, training frequency, or programming techniques, including “fancy” ones like supersets, rest-pause training, and blood flow restriction training. Progressive overload is the master key to more muscle and if you don’t get it right, you’re always going to struggle to develop your shoulders (and every other muscle group, for that matter). In other words, the key to gaining muscle and strength isn’t doing a laundry list of different exercises, balancing on a BOSU ball, or seeing how much you can sweat on everything in the gym. It’s making your muscles work harder over time. And this is exactly what you do when you gradually force them to handle heavier and heavier weights. 3. Doing a lot of high-rep training. This was a rather “shocking” lesson to learn because I’d always believed heavy weightlifting was for gaining strength, not size. In fact, as natural weightlifters, increasing our whole-body strength is one of the most effective ways to gain muscle. So much so that it should be one of our primary goals in our training, and to accomplish that, we need to do a lot of heavy weightlifting. What this means is to maximize the development of any major muscle group in your body, you need to focus on compound exercises and heavy weights. And for the shoulders, that means a lot of heavy barbell and dumbbell pressing with some supplementary work for the side and rear delts. With the right drugs, someone can basically sit in the gym for a few hours every day doing set after set, exercise after exercise, and his (or her) muscles will just get bigger and bigger. A good example of the muscle-building power of steroids comes from a study conducted by scientists at the Charles R. Drew University of Medicine and Science. This is because these areas of the body are quite dense in androgen receptors, which are proteins on the surface of cells that respond to anabolic hormones like testosterone. Thus, when large amounts of anabolic steroids are introduced into the body, the shoulders, traps, and pecs grow very quickly and can reach freaky levels of size compared to other muscle groups. 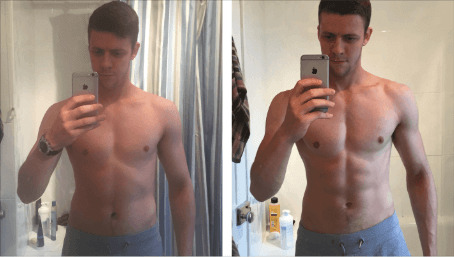 Steroids also make gaining and maintaining muscle while cutting not just possible but relatively easy, which allows people to maintain levels of leanness, strength, and muscularity that simply aren’t possible or sustainable without drugs. Target the front, side, and rear delts separately. Do a lot of compound exercises and heavy weightlifting. Do one to three shoulder workouts per week. Let’s look at each part of this plan. The front delts are heavily involved in all pressing exercises, and this is particularly true of the bench and incline bench press. On the one hand, this is helpful because so long as you’re doing some heavy pressing every week, your front delts will receive a fair amount of training. On the other hand, most upper body exercises don’t train the side and rear delts to nearly the same degree, which can produce an imbalance between the deltoids over time. This is common among guys in particular, who love to press and whose front delts have significantly outpaced their side and rear delts in overall strength and size. Many guys supplement their pressing with front raises, which target the anterior deltoids and further exacerbate the problem. This is why I recommend you give your side and rear delts plenty of attention in your shoulder workouts. It’s okay to include shoulder exercises that emphasize the front delts, but if you’re training your chest, your front delts are already getting plenty of attention. Bench and incline press two to three times per week for overall upper body development. Exercises that involve both shoulder extension (such as a side lateral raise) and rotation (such as a reverse fly) to train both your side and rear delts. Train with heavy weights to increase muscle activation of all three deltoids. The workout program I share later in this article incorporates each of these tips. I know, I’m repeating myself, but it’s just that important. So long as you make that your primary focus in your training, you’ll have no trouble gaining the size and definition you want. Heavy, compound resistance training is the most effective way to get stronger. This isn’t a special rule just for the shoulders, either. It applies equally to every major muscle group in the body, including the smaller, more stubborn ones like the arms, calves, and chest, as well as the bigger, more responsive ones like the legs and back. Therefore, if you want to get a big, rounded, or even just “defined” shoulders as quickly as possible, then you want to get strong shoulders as quickly as possible. And that means doing a lot of heavy shoulder training, and a lot of heavy pressing in particular. Practically speaking, this means taking each set to about one to two reps shy of technical failure (the point at which you can’t complete another rep without a breakdown in form). Another way of looking at this is finishing each set with one to two “reps in reserve,” as researchers call it. What do I mean by “compound exercises“? Well, these are exercises that involve multiple joints and muscles, as opposed to isolation exercises that focus on a single joint and a limited number of muscles. For example, an isolation exercise like the dumbbell side raise primarily involves the shoulder joint and the traps, whereas a compound exercise like the barbell overhead press involves the shoulder and elbow joints and the pecs, deltoids, triceps, back, and even the legs to a slight degree. You’ll learn the most effective compound exercises and how much weight to use in the program I share below. There’s nothing wrong with training major muscle groups several times per week, but is it absolutely necessary? Well, a “set” is a fixed number of repetitions of a particular exercise, and a “hard set” is a heavy, muscle- and strength-building set that’s taken close to technical failure (the point where you can no longer continue with proper form). For example, you can expect more or less the same amount of muscle and strength gains from doing 12 hard sets for your shoulders on Monday or doing 4 hard sets for your shoulders on Monday, Wednesday, and Friday. With that out of the way, let’s get to the obvious question: How many hard sets should you do per week to build great shoulders? This applies to the shoulders as well as every other major muscle group. 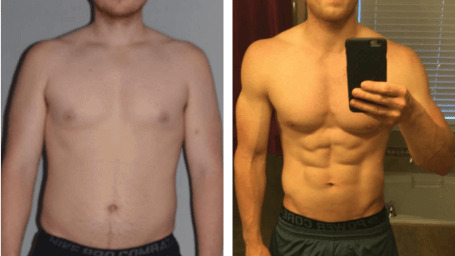 That said, now and then, I do hear from people (guys, mostly) who appear to be doing everything right but simply aren’t seeing significant changes in their shoulder size and strength. Train shoulders two or three times per week on nonconsecutive days. Temporarily increase the number of weekly hard sets to 18 to 27. For example, if they’re currently training shoulders on Mondays and Thursdays, I’d have them reshuffle their schedule so they can train shoulders on Mondays, Wednesdays, and Fridays (remember, this is including chest workouts, which also train the shoulders). Alright, now that we have basic training theory under our belts, let’s look at the seven best shoulder exercises. Poke around on the Internet for shoulder workouts and you’ll quickly be overwhelmed. You’ll find at least a hundred different exercises suggested for a hundred different reasons. The good news, though, is only a small handful are really necessary. The following exercises are what I’ve used to dramatically improve my shoulders. These movements emphasize the anterior deltoid but heavily involve the other two heads, as well as the rotator cuff muscles. They’re are also safest for overloading your shoulders with heavy weights. Both require a large amount of upper body strength and stability, and I’ve found them complementary and have done both for years now. Similar to barbell vs. dumbbell pressing, EMG research indicates that standing pressing may be more effective, but, again, I don’t put much stock in this. What’s most definitely true is standing pressing is significantly harder than seated. I was comfortably repping 205 pounds on the seated barbell press and when I first switched to the standing press, I struggled with 165 pounds. In weightlifting, harder generally means better, but standing pressing is more challenging mainly because of the core and lower back strength and stability and technical skill it requires, not because it’s training your shoulder muscles more intensively. That makes the standing (overhead) press a better whole-body exercise, but not necessarily a better shoulder exercise. In fact, I’d argue that the seated press may be better for long-term shoulder gains because it allows you to progress into heavier weights faster (because your strength isn’t as limited by your core and back strength or balance and coordination). In a sense, seated pressing allows you to “target” your shoulders more with the weights you’re handling. Furthermore, if you’re doing heavy deadlifting and squatting every week (which you should), you probably don’t need the additional core and lower back training that comes with overhead pressing. The bottom line, though, is you can’t really go wrong with standing or seated so long as you’re doing some form of heavy pressing every week. If you’re more comfortable with or just like standing barbell pressing more, you can leave seated out of your routine. If it’s the other way around—if you’re more comfortable with or enjoy seated barbell pressing more—that’s fine, too. I like to alternate between both standing and seated, similar to how I alternate between barbell and dumbbell presses. It’s also worth mentioning that I don’t do standing dumbbell presses because they don’t allow for heavy enough weights. The dumbbell Arnold press is a variation of the traditional dumbbell military press that increases the range of motion. Due to the additional work your shoulders have to do, the Arnold press reduces how much weight you can use, though. This is why I like to do it after a seated or standing barbell press. In other words, I treat the Arnold press as an “accessory exercise” for my anterior (front) deltoids. It can be useful for supplementing your pressing, but it’s not a good replacement for it because it just can’t deliver anywhere near the same results. As you learned a moment ago, most people are already doing enough for their anterior delts by pressing heavy a few times per week, so there’s often no need for additional front delt training. That said, if you feel your front delts are lagging, doing a few sets of dumbbell front raises per week can help bring them up to par. It targets the side deltoids, which accounts for a lot of the shoulder roundness and “pop” that we want, and which need special attention. The face pull is good for strengthening both the rear delts and rotator cuffs. The best type of shoulder workout is one that involves several exercises to properly train each of the three deltoids (and, as a byproduct, the rotator cuff muscles as well). It ideally involves at least one compound movement, like a barbell or dumbbell press, and emphasizes heavy lifting. The following workout is a great introduction to this style of training and it’s equally applicable to both men and women. This is mainly because most women start out much weaker than men and have little or no resistance training experience and thus can’t comfortably work with weights that are closer to their one-rep max. So, do the following workout once every 5 to 7 days for the next 8 weeks, and I think you’ll be very happy with the results. That’s it. And trust me—it’s harder than it looks. For instance, if you military press 135 pounds for 6 reps on your first set, you add 5 pounds to each side of the bar for your next set. If, on the next set, you can get at least 4 reps with 145 pounds, that’s the new weight you work with until you can military press it for 6 reps, move up, and so forth. You see, supplements don’t build great physiques—dedication to proper training and nutrition does. That’s why I took matters into my own hands and decided to create my own supplements. And not just another line of “me too” supplements—the exact formulations I myself have always wanted and wished others would create. So if you want to gain muscle and strength faster and recover better from your workouts, you want to try Recharge today. So if you want to try a 100% naturally sweetened and flavored whey isolate protein powder made from exceptionally high-quality milk that tastes and mixes great, you want to try Whey+ today. The bottom line is if you want to know what a pre-workout is supposed to feel like and want to experience the type of energy rush and performance boost that only clinically effective dosages of scientifically validated ingredients can deliver, you want to try Pulse. The reality is anyone that says building impressive shoulders is easy is lying. The shoulders are small, stubborn muscles that take months to grow and years to reach their full potential for size and strength. It takes a lot of work and patience, to get there, but can be done. Doing the wrong shoulder exercises. Doing a lot of high-rep training. Target both the front, side, and rear delts. Do compound exercises and lift heavy weights. The seven best shoulder exercises are . . .
And remember, the key is not just doing these exercises but progressing on them, so make sure you track your workouts (I suggest a spreadsheet or my app, Stacked) and try to add weight, reps, or both as often as possible. You don’t need supplements to build great shoulders, but taking creatine, protein powder, and my pre-workout supplement, Pulse, can help you get more out of your diet and workouts. 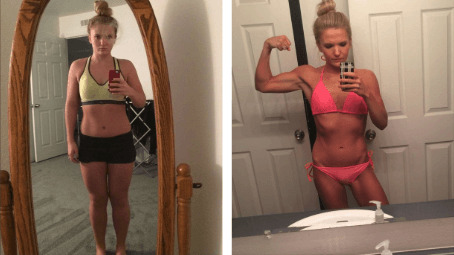 Another key factor in progressing on these exercises is organizing them into effective workouts and workout routines, like those shared in this article. Oh, and if you know someone with itty-bitty little shoulders who could benefit from reading this article, would you mind sending it his or her way?